As much as we enjoy a traditional Thanksgiving made up of too much food, drink and merriment, we strongly recommend restricting those activities to the humans in your family. 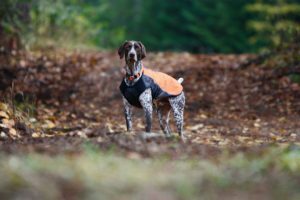 The typical tabletop filled with salty, savory turkey and gravy, buttery rolls, cream of mushroom with green beans and other favorites is a best case scenario for you, but all of the mentioned foods can be poisonous or otherwise harmful to a four-legged friend. That’s even before worrying about potential anxiety, winter travel and the permissive atmosphere for controlled gluttony. 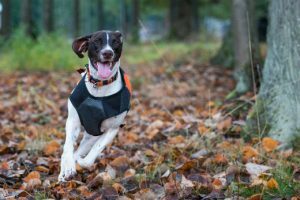 We’ve put together some tips you can utilize during the holiday so that you and your dog have a great deal to be thankful for over the holiday week. Salt and fat make up nearly everything good in our Thanksgiving meals. Your dog agrees. Those substances taste as good to her as they do to you. Sadly for your dog, her body can’t process them nearly as well as you can. According to the American Veterinary Medical Association, fatty foods are difficult for your dog to digest, which can cause serious discomfort. Those little pieces of turkey meat or a small patch of skin can even cause a potentially fatal case of pancreatitis, the AVMA states. Most people have heard that chocolate can be toxic to your companion if ingested, but few know that there are other sweets and common table foods that can also be harmful. The American Society for the Prevention of Cruelty to Animals lists onions, garlic, chives, dairy products, grapes, raisins and citrus foods as harmful to your dog’s health. It’s easy to avoid giving those problem foods to your pet to be sure, but it might be a little harder to avoid giving your little buddy an extra something altogether. After all, everyone else is enjoying a little decadence. Why shouldn’t your very good dog get a little spoiled too? We recommend planning in advance. When you’re shopping for your own meal, pick up a special treat made safely and specifically for dogs. When you enjoy your dessert, let him enjoy his. The bones from your turkey carcass are more likely than not the most dangerous thing your dog will run across on Thanksgiving. Don’t feed your companion those bones and make sure to secure them before taking your post-meal nap. A sly dog that can grab bones off a platter or a finished plate may face a grisly list of possible consequences as laid out by the United States Food and Drug Administration, such as choking, cuts to the mouth and throat, intestinal blockage, vomiting, diarrhea, rectal bleeding and death. So clean up as soon as you can, make sure garbage cans are secure and keep one eye of your dog. Humans aren’t the only ones who can get stressed out during the holidays. Especially if you are hosting friends or family during Thanksgiving, the added activity around the house can make your best friend a little neurotic. If you see your buddy acting strangely or being tense, try and devise an activity that keeps her away from the hustle and bustle of the party. Stressed out pets can get lost trying to escape the din or, worse, snap at a guest. Puzzle toys with treats in them or some crate time can be great diversions for a dog struggling to adjust. If you are one of the millions of families who travel to see loved ones over the holiday, make sure to travel safe. Your dog is at high risk when riding in your car – and can put you at higher risk with distractions. Untethered dogs can even harm passengers in the event of a crash. Be careful and check out these tips for driving safely with your dog. It’s no secret that Thanksgiving isn’t the best holiday for your diet. But that doesn’t mean you have to surrender to vice altogether over the weekend. Your dog can be the perfect motivator to make sure that you get a couple of minutes of exercise for every cup of gravy. Go for a walk before your meal. Stop somewhere for some intense playtime with your companion while you’re out. A tuckered out dog is a dog less likely to sneak food, stress about company or get in your way while serving. You get to burn a few calories on a day you’ll have quite a few to spare. A little vigilance this holiday week will go a long way. Make sure to enjoy your meal safely.